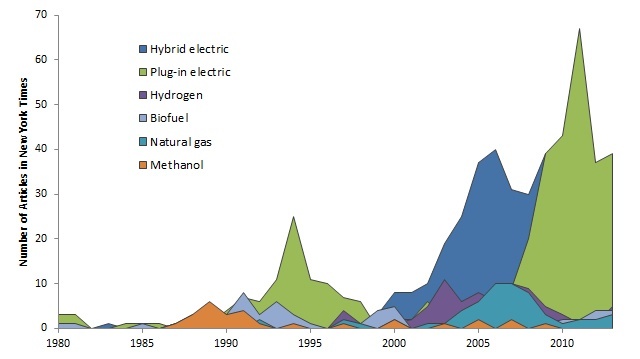 Abstract: Forecasts for alternative-fuel passenger vehicles sales have varied widely over the past three decades, often proving overly optimistic. In the case of plug-in electric vehicles (PEVs), published forecasts of new market share in North America have ranged from 1% to 28% in 2020, and from 1% to 70% by 2030. To improve understanding of such forecasts, we develop the REspondent-based Preference and Constraint (REPAC) model to simulate PEV new market share by representing key components of PEV demand, PEV supply and relevant policy. Specifically, REPAC uses a latent class discrete choice model previously estimated from data collected via a 2013 survey of 531 new vehicle-buying households in British Columbia, Canada. REPAC treats these choice model results as a measure of unconstrained demand for PEVs, and then adds consumer constraints (PEV awareness and home charging access) as well as supply constraints that represent the limited variety and availability of PEV models. REPAC’s baseline (“no-policy”) scenario for annual PEV sales is 1.4% in 2020 and 7% in 2030. With strong demand-focused PEV policies in place (purchase subsidies and charger rollout), 2030 market share ranges from 17% to 28%, while strong supply-focused policy is also required to achieve 2030 market shares over 30% (e.g. a policy that incentivizes or requires automaker to increase the availability and variety of PEV makes and models). REPAC’s forecasts are most sensitive to assumptions about PEV home charging access, PEV model availability and variety, consumer familiarity with PEVs, and incremental purchase price. This figure from the study shows how plug-in electric vehicle market share is expected to vary with different types of policies. Full Citation: Wolinetz, M. & J. Axsen. 2017. How policy can build the plug-in electric vehicle market: Insights from the REspondent-based Preference And Constraints (REPAC) model. Technological Forecasting and Social Change 117:238-250.